Aluminum Dye Manufacturer Taiwan - Taiwan Dyestuffs & Pigments Corp.
We are pleased to take this opportunity to introduce ourselves to you as one of the most reputable dyestuffs, pigments and auxiliary manufacturers: Taiwan Dyestuffs & Pigments Corp. We are a well-organized and experienced firm headquartered in Taiwan, and the manufacturing plants are located in Taiwan, China and Thailand. Our products are of the highest quality due to stringent quality control measures that assure batch to batch uniformity. We are proud of being one of ISO certified companies. Since 1996, we have been a major international dyestuff, pigment and auxiliary manufacturer. With the support of our customers, we have been enjoying a very successful sales of our products. Taiwan Dyestuffs & Pigments Corp. is committed to provide the customer with the high quality products and services. Aluminum Dye (Colorantes de aluminio) is one of our main products, featuring its high quality and a wide range of applications. As an independent Aluminum Dye (Colorantes de aluminio) integrator, Taiwan Dyestuffs & Pigments Corp. is free to specify and select the best of Aluminum Dye (Colorantes de aluminio) regardless of the manufacturer. 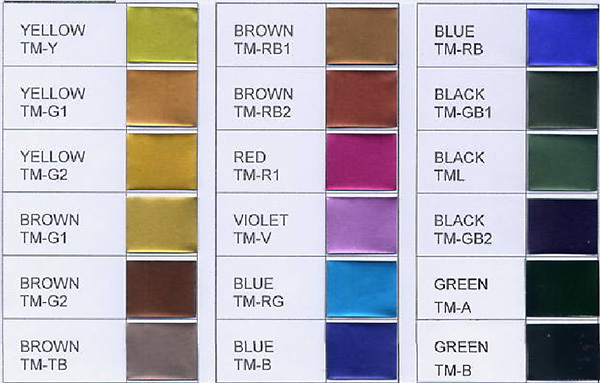 Dyeing time:	:3~5 minutes for film thickness 10 –12um. Taiwan Dyestuffs & Pigments Corp. delivers a broad range of innovative and reliable Aluminum Dye Manufacturer Taiwan and controls solutions specifically designed to maximize performance, energy efficiency and cost savings. Our mission is to be innovative through new designs and to produce the highest quality products at incredible value. If you are unable to find the product you desire let us know, and we will endeavour to satisfy your requirements within the shortest possible timescale. 9F, 523, GINKUO ROAD, TAOYUAN CITY, TAIWAN, R.O.C.